A classically trained chef, Paul Ainsworth served his apprenticeship working under some of the most respected figures of the contemporary era. 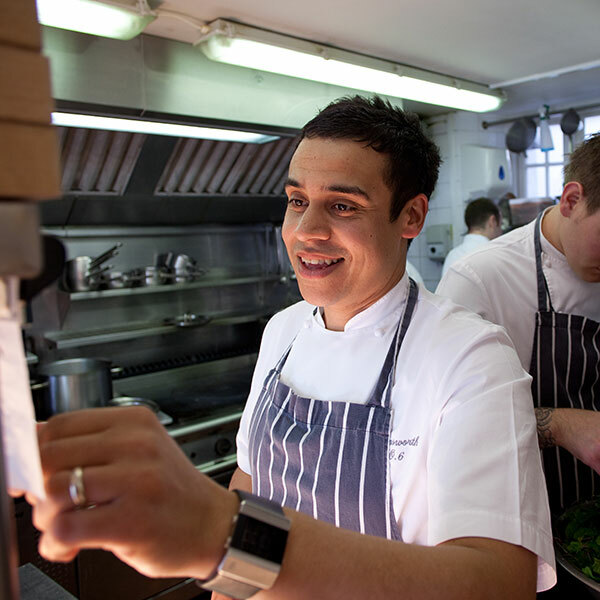 Born in Southampton in 1979, Paul studied catering and hospitality at Southampton City College before following the lights to London’s restaurant trade. From 1998, he spent two years with Gary Rhodes at Rhodes in the Square, and then three years with Gordon Ramsay working at Royal Hospital Road. Both were completely different from each other but it was here his passion for food and flavour really began. In 2003, Paul moved to the original Petrus site to work for Marcus Wareing for three years before finishing his time in London at the Berkeley Hotel with Marcus. After eight years of living in the city and working 18-hour days, a pivotal moment in Paul’s career occurred in 2006 when he opened Number 6 in Padstow. After taking sole occupancy in 2009, he reworked the menu around the ethos it holds today: quality ingredients, often humble in nature, used to create meals with smooth clean flavours that offer great value for money. Paul knows he is really lucky to have some of the best produce available on his doorstep. Moving to Cornwall proved to him that the only way to cook is with local, seasonal produce, which is reflected in every dish he produces. In May 2010 Paul decided to start on a new venture: Rojano’s in the Square, an Italian style restaurant positioned in a great location just off the harbour in Padstow. Paul has a real passion for Italian food so it was very exciting for him to be able to create brand new menus. Paul’s aim regarding the style of Rojano’s is affordable Italian comfort food, with the emphasis always on taste and quality. In 2011, Paul got the call to appear on the BBC2 TV series Great British Menu. Competing against some of the nation’s top chefs was an amazing experience, and he was so pleased to win the regional heats and represent the South West. In the final week, Paul’s dessert ‘Taste of the Fairground’ was chosen to be served to 100 guests at a banquet at London’s Leadenhall Market. The Fishermen’s Mission in Penzance and The RNLI in Padstow inspired his menu for the banquet, and representatives from the organisations were invited to attend as guests of honour. Paul has recently expanded his business further with the purchase of the 18th century Padstow Townhouse which, after renovation work, is now open for guest accommodation.